One of my favorite jewelry designers, Emma from Unique by Emma is offering a wonderful selection of jewelry that would be perfect for the holidays! From necklaces, bracelets and earrings, Unique by Emma has lovely pieces that would work for all your holiday celebrations and will also make excellent gift ideas too. 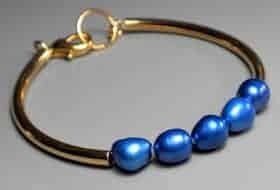 The Blue Pearl & Gold Tube Bracelet ($25) is absolutely stunning in its simple elegance. It is hand crafted and features bright blue freshwater pearls in the center of gold plated tubes. I really like that this bracelet is so feminine. It is also lightweight so it is extremely comfortable to wear and delicate yet surprisingly durable. It can be worn for dressier events as well as every day occasions too. At 7” long this bracelet fits my wrist perfectly but can also be resized upon request. Are you searching for a special pair of earrings? I especially like the show stopping White Pearl Gold Teardrop Earrings ($35) that would really look pretty for holiday photos, dinner parties and other special occasions. I am always amazed at the affordable prices for the jewelry featured at Unique, by Emma. The quality and value of these pieces in the collection is extraordinary and you can feel confident that you are receiving beautiful jewelry that has been hand crafted with love by the talented designer at Unique, by Emma. You are invited to visit Unique, by Emma to purchase your favorite jewelry…..go ahead and treat yourself (or someone you love) to something fabulous!